Thousands of people across the United States walked out of work and classrooms for a nationwide day of action dubbed 'Hands Up, Walk Out!' The protest comes after a grand jury declined to indict an officer for killing a black teenager. The organizers – driven primarily by young people – spread the word online via the hashtag #HandsUpWalkOut, asking people to walk out in solidarity with those affected by police violence in Ferguson, Missouri, and around the country. 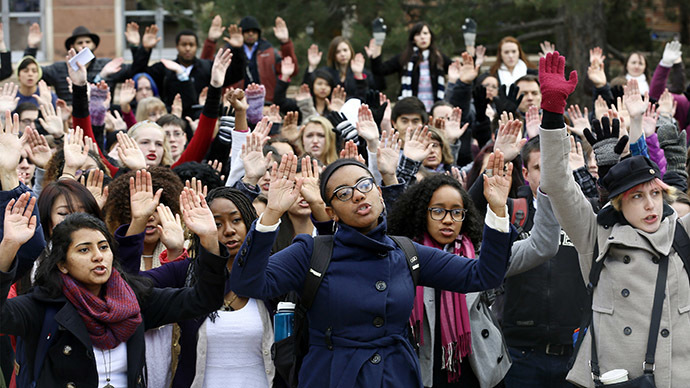 The walkouts occurred simultaneously at 12 p.m. CST and referenced the 'Hands Up! Don't Shoot!' chant that has been used as a rallying cry all over the US ever since African American teenager Michael Brown, 18, was fatally shot by Officer Darren Wilson on August 9. The campaign also remembered other people lost to police violence, including John Crawford III, Eric Garner, Tamir Rice, Akai Gurley, Israel Hernandez, Oscar Grant, Ezell Ford, and Ramarley Graham. Additionally, the campaign comes with a list of demands: an end to all forms of discrimination, the full recognition of human rights, justice for Michael Brown, and freedom for all communities. Specifically, organizers want the US government to "acknowledge and address structural violence and institutional discrimination that continues to imprison our communities either in a life of poverty and/or one behind bars. We want the United States Government to recognize the full spectrum of our human rights and its obligations under international law." They are also calling for “an immediate end to police brutality and the murder of black, brown & all oppressed people," full employment, decent housing, quality education and affordable college education, an end to the prison industrial complex, and a de-militarization of local law enforcement.